Universal Urethane coil storage pads are designed for an easy, safe and cost effective way to store steel, aluminum and brass coils on warehouse floors. 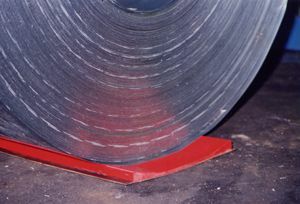 Our polyurethane floor pads help organize coil storage while also preventing damage to the outer layers of metal. can come with oil collection reservoirs, countersunk bolt holes or both. 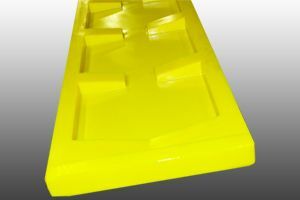 Our polyurethane floor pads come in safety yellow, orange and red colors making them easily visible to crane operators when storing a coil. The floor pads are easy to lay end to end for coil storage organization and can keep floors clean of oil with oil collection reservoirs. Universal Urethane coil storage pads do offer a “green” alternative to coil storage. Our pads can take the place of wooden saddles and unlike the wooden floor saddles, our urethane floor pads are virtually indestructible. Our polyurethane pads will not mark the outer layers of the coils being stored. Protect your surface critical metals with high performance polyurethane coil storage pads from Universal Urethane. With proper installation and usage, urethane floor storage pads protect metal product from damage and reduces scrap and waste. Our polyurethane floor mats work for all materials stored on the floor that can be damaged in the storage process. Neither option adds to the cost of the floor pad. 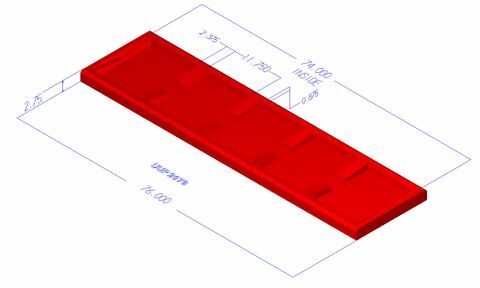 20" wide "V' shaped x 76" long coil pad. Designed for coils up to 72" long. This pad will contain 100% of all oil that comes from coils. No oil will leak to the floor with this pad. These options are available for all of our coil storage pads.